5-piece, male/female lead vocals, 2x1 hour or 3x40 minute sets. Recorded music during breaks. Acoustic duo available for drinks reception for an additional fee. D-Jazz are a sparkling band of extremely talented musicians. Far more than just a jazz band, their repertoire also covers all kinds of dance music from the 1960s to recent hits. This gives D-Jazz great versatility and means they can play cool background music and dinner jazz for part of a reception ( and are often featured at "Gatsby" themed events to do just that ) - and then switch up a gear to provide great dance music for all ages,to fill the dancefloor as a straight ahead covers band. No surprise then that celebrities including Sir Paul McCartney, Pink Floyd’s Dave Gilmour, Tina Turner and Sir Anthony Hopkins have booked this superb band for their private parties. They normally appear as a five-piece: male vocals/guitar, female vocals, keyboard, double bass and drums but they can also slim down to a four-piece or add a sax player to make a six-piece band. Our price is based on the five-piece band. The band normally play for around two-and-a-half hours divided into two or three sets, and can play recorded music through their PA system during their breaks and before the start of their performance. 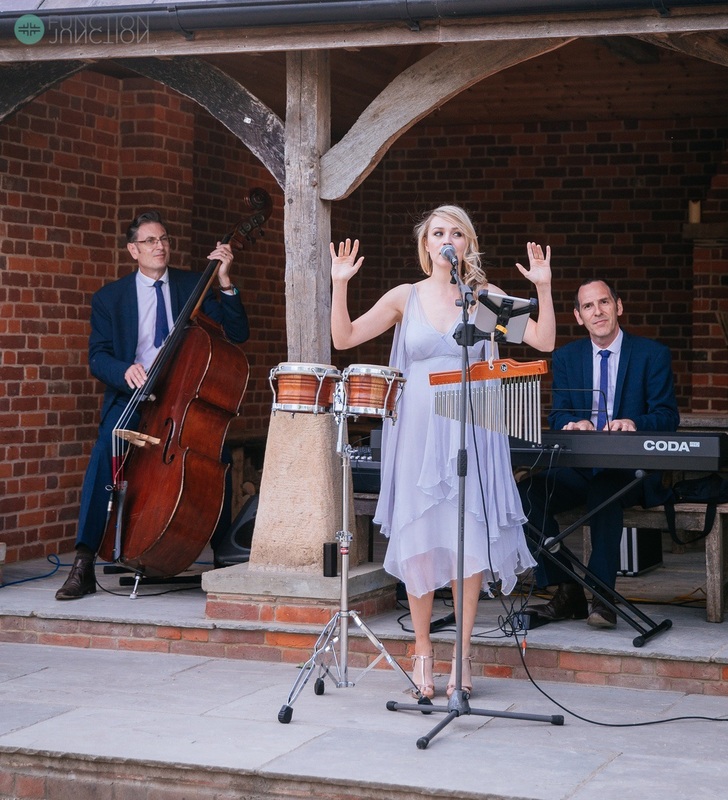 If you are having a pre-dinner drinks reception, you also might want to consider, for a small additional charge, having the keyboard and double bass player provide an instrumental duo, or adding female vocal too, to play some welcoming background music. D-Jazz have played at numerous weddings and corporate functions at top venues in London and around the country, as well as at private events and celebrations in Paris, Berlin, Rome, Monte Carlo, Prague, Florence, Sicily, Santorini, and even as far afield as Azerbaijan, Mauritius, and Cambodia. Both British and Hollywood Royalty have all enjoyed the band, and Sir Paul McCartney even joined them on stage to sing at his Christmas party ! "Excellent performance. Everyone enjoyed. Will definitely recommend - already have!" "Thanks so much for making our wedding such a fantastic night. It was so important to us that we had everyone on the dance floor all the time and you totally achieved that. People are still talking about how amazing the band was! You were completely professional from start to finish and an absolute pleasure to deal with." "We had a fantastic day and you guys topped it off with an incredible performance in the evening! Many of our guests mentioned that you were the best wedding band they've seen and my feet were aching for days afterwards as I spent the whole night on the dance floor! Hopefully see you guys play live again soon." "Thank you, thank you, thank you for playing at our wedding... You guys were absolutely fantastic - we had every single guest up dancing and as the bride I don't think I got off the dance floor. INCREDIBLE !!!!!!! Can't wait to see you again." "The Jazz Dynamos made my Party - they created an amazing atmosphere and were great fun, great to dance to and to listen to, and were enjoyed by young and old alike." "Fantastic band, did such a brilliant job at our wedding, not a typical 'wedding band' at all, but got everyone dancing and kept everyone happy - old and young alike. Book them now!" "… The band were great – it is a testament to them that both young and old all danced the night away – including the trendy twenty somethings!!" "They were very professional and I have received many compliments about them from our guests." "They really are a tremendous band and we had many compliments from our guests, some of whom take a great interest in music and indeed are musicians themselves…we would like to pass on our thanks to the band and also the pianist who played at the initial reception drinks. Everyone was very polite, professional and punctual."